Trump's populism is only the beginning. Here come the robots. Populism is sweeping the nation, but it's likely just getting started. Donald Trump's win is a wake-up call that voters are angry with a system that's made middle-class jobs tougher to come by, and increased inequality. As pronounced as the trend already is, it's only just the beginning, experts say. Looming technological advances will wipe out more jobs, broadening the base of disenfranchised, unemployable and frustrated citizens. Meanwhile, elites with the skills to flourish in the digital economy will get richer. And governments will have to figure out how to help struggling citizens. Manufacturing jobs aren't the only ones at risk. Pizza delivery guys, garbagemen, radiologists, retail workers, truck drivers, call-center workers and cab drivers are among the most obvious casualties. The technology world is going through tremendous advances in artificial intelligence that are powering everything from self-driving cars to apps that help diagnose cancer. Many benefits await society. The change is so profound that some have started to call artificial intelligence the new electricity. But like all technologies, it's a double-edged sword, and a lot of people are about to get shocked. "It's going to get worse. The inequality will get worse. There's going to be more anger and social upheaval," said Martin Ford, author of Rise of the Robots: Technology and the Threat of a Jobless Future. "What we're seeing is in large measure because of technology." Trump ran on issues of immigration and trade. Ford argues this is because it's easiest for people to point a finger at another person, be it a worker in China or an immigrant. The true culprit, as Ford sees it, is new technologies that have made it increasingly possible to automate traditional middle class jobs. The education required to hold down a middle class gig is increasing. There are new jobs, but most don't guarantee the lifestyle of yesteryear. Median American wages have been flat for decades, even as the country's economy grows -- concentrating wealth in fewer hands. "We talked 20, 25 years ago about the need for more than a high school education," said David Colburn, a history professor at the University of Florida. "Now we're talking about the need for more than a community college education. And in some cases, we're talking about a greater need than just a college education." We're already seeing signs of how unemployment could run rampant, triggering a broader populist backlash. This week, Domino's began delivering pizzas with drones in New Zealand. When an autonomous drone can make deliveries, there's little need for humans to drive cars or trucks. Amazon (AMZN) also is investing heavily in drone delivery. And Starbucks (SBUX) has reportedly talked with Google (GOOGL) about delivering coffee via drone. 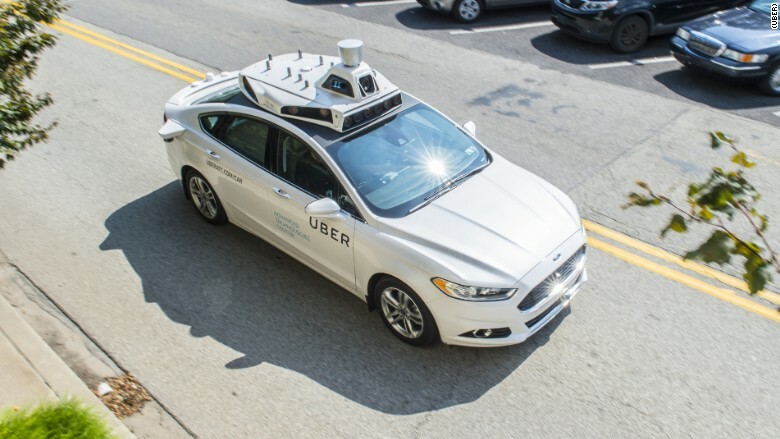 Car and tech companies like Google, Uber, Ford (F), Toyota (TM), Intel (INTC), Daimler, Samsung and GM (GM) are investing in autonomous vehicle technology. This October, Budweiser delivered beer in Colorado thanks to a self-driving truck. While new jobs may sound like a good thing, this is actually dangerous for workers' job security. 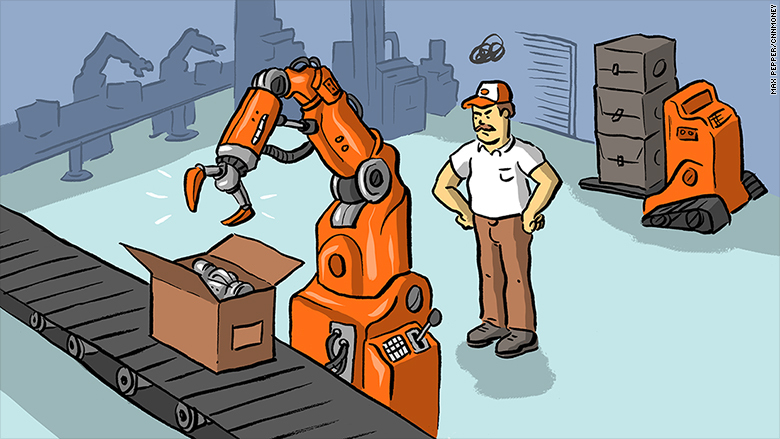 Warehouse work is far easier for a machine to learn, according to Ford. 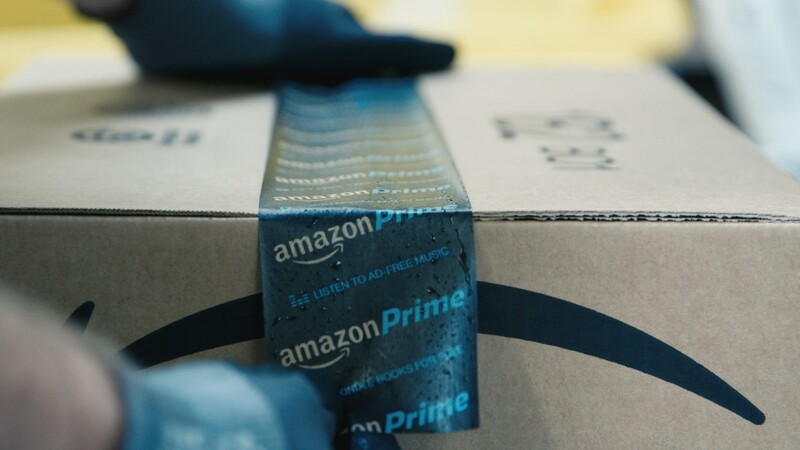 It's much simpler for a robot to learn to box up a package in an Amazon fulfillment center, rather than standing at a Macy's checkout counter, making small talk with a customer. 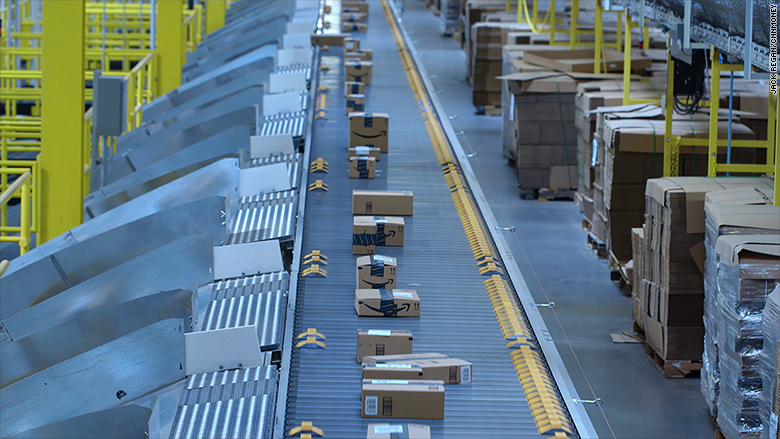 Warehouses are controlled, predictable environments -- brick and mortar stores are not. So what do we do about this? We could try and bring factories back from overseas, as Trump has suggested. Yet much of the work available in factories appears to have a shelf life due to robots' increasing capabilities. "The universal consensus from the smartest people in the world is that universal basic income is a given," said John Marshall, chief innovation officer at Lippincott, a creative consultancy that convenes expert panels for its clients on issues such as basic income. "It's something that society won't be able to function without." Yet figuring out how such a system could be afforded -- and not turn a country into a nation of slackers -- is unclear. Several countries, including Finland and the Netherlands, are taking the concept seriously. "I don't think we're anywhere near the brainpower we need focused on this problem to solve it," Ford said.